As a Thailand’s leading Energy Company, PTT Public Company Limited strongly believes that a higher-education research institute dedicated to science and technology with the missions to foster exceptional scientists and to build cutting-edge knowledge and innovation is crucial for the nation. Therefore, PTT Group has founded Rayong Institute of Science and Technology Foundation to establish Vidyasirimedhi Institute of Science and Technology (VISTEC), the first world-class research and educational institute in science and technology in Rayong, Thailand, with the emphasis on knowledge discovery and interdisciplinary cutting-edge research. 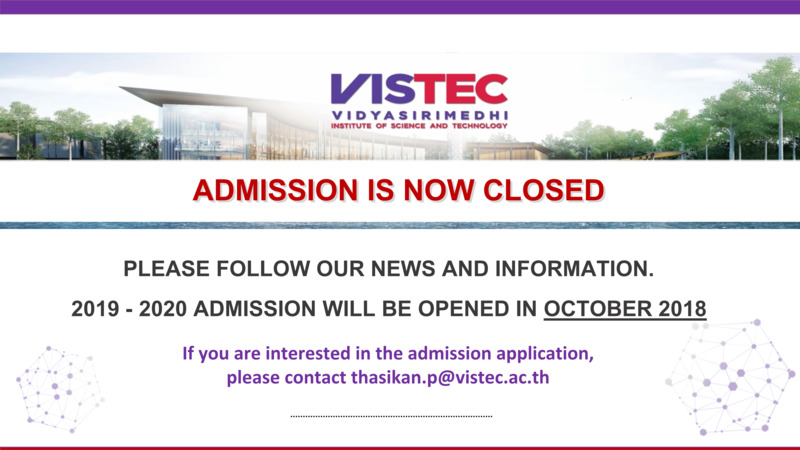 VISTEC has opened admission for all applicants to apply for Master and Doctoral degree programs in Materials Science and Engineering (International Program) in the School of Molecular Science and Engineering (MSE) and Master and Doctoral degree programs in Chemical Engineering (International Program) in the School of Energy Science and Engineering (ESE). Moreover, the admission is opened for Master and Doctoral degree programs in the Schools of Biomolecular Science and Engineering (BSE) and Information Science and Technology (IST). The first semester of the academic year 2018-2019 will start in August 2018. 3. Srimedhi Scholarship receiver will be granted by Her Royal Highness Princess Maka Sirindhorn to receive THB 2,000,000 for conducting research abroad. •	Residences for all students with weekly transportation back and forth between VISTEC and Bangkok also provided.